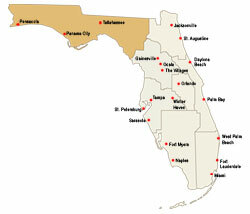 Florida has a reputation as a senior-friendly state, but the Panhandle region is especially welcoming to seniors. There is so much that the area has to offer seniors: The mild climate is certainly high on the list of most people who retire here. The small-town life somehow manages to support an arts and cultural scene worthy of a much larger metropolitan area. The health-care system is outstanding. And there’s plenty to do, including church activities, festivals, craft groups, gaming and hobby clubs, fraternal organizations, dances, theater, symphony and opera performances—you name it. Copeland Community Center with heated swimming pool, activity room, Jacuzzi, exercise equipment, billiards, shuffleboard, tennis, horseshoes. Volunteer in many ways. We value your skills! Connecting you to the world through computers - Internet access brings the world to you for adventures in learning, emailing, research, investing, and more. Training for prevention and management of health problems, such as fibromyalgia, osteoporosis, and diabetes. Welcome to Advent Christian Village retirement community, an accredited, comprehensive retirement community, where living is always a matter of choice--your choice! We are located on 1,000 breathtaking acres of woodlands and scenic landscapes along the historic Suwannee River. This retirement community offers the best in Florida living...friends, security, a continuum of care, active lifestyle, and country living with the conveniences of a small town community. ACV retirement community combines a full range of lifestyle and residence options assuring access to long-term quality health care. There are no entrance fees. ACV retirement community offers a wide variety of rental housing styles and floor plans including apartments and homes. River Woods Subdivision and Park of the Pines residents own their homes. Comforts and conveniences, such as 24-hour security and medical personnel, lawn maintenance, transportation, and other benefits, make the ACV's retirement community atmosphere ideal for worry-free living. The community of Palmetto Trace is located 1/2 mile from the Gulf of Mexico in Panama City Beach at the corner of Cambridge Boulevard and Back Beach Road/U.S. Highway 98. Traveling south on State Road 79, turn left on U.S. Highway 98. Palmetto Trace is two miles on the left. At the community of Palmetto Trace we have designed the homes to reflect the way you live. From the Palmetto Trace townhomes, designed for empty nesters and first-time home buyers offering practically maintenance-free living, to three- and four-bedroom, single-family homes with dramatic natural views. In every Palmetto Trace home you will find superior, award-winning designs, attention to detail and our commitment to quality in your community for family living or retirement.